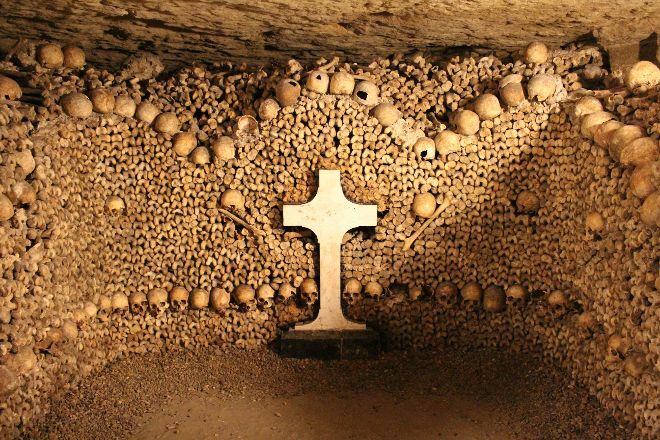 One of the most astonishing sights in Paris, The Paris Catacombs hold the remains of an estimated six million people's bones in a labyrinth of caverns and tunnels. Under Paris, the stone mines contain a harrowing arrangement of skulls and femurs that form many walls. Some of the arrangements are artistic, such as a heart-shaped outline on one wall, formed with skulls embedded in surrounding tibia bones. Audio guides are available in English that enable you to discover the site for yourself. To visit The Paris Catacombs and get the most from your holiday in Paris, create itinerary details personal to you using our Paris trip planner . The Catacombs was a cool experience for me since I have always heard of them and seen them in Hollywood movies. I had a skip the line pass so I was able to get in super quick! You have to walk down a long flight of stairs to get to the bottom. My overall experience was decent. I was really hoping it would be really freaky and scary but I found no such thing. Everything down there was very well lit and organized. My whole tour from start to finish took about 45 minutes. It’s a one time thing which is cool to see but I wouldn’t visit again in the future. I went at 6:50 PM on October 19, 2018. I arrived at 6:45 PM and was able to get in by 7:15 PM so I barely made the cutoff time which is at 7:30 PM. Price is 13 euros for people over 27 and 11 euros for people under. Babies are free I think? So to start off, most of the tunnel that tourists gets to see is pretty much a.. stone tunnel. You'll eventually get to the skeletons and skulls, but it wasn't really much. To be honest, it did feel artificial especially with a heart shaped out using skulls and the pretty skeletons laid out for us to see. I know these are probably real and there are endless tunnels that goes roughly 200 mile's worth; something you wont see here. There is also an unused train track that has an entrance in the wall that can lead you to the more deep parts of the area. I wouldn't recommend it, but that's where it would feel more creepy/fun. It was a nice short experience, though. There is also a restroom at the way end of the catacombs once you make your wake up the stairs and into the gift shop, in case some are worried about that.